As an intelligent, relatively young man I am really tired of the “formula” for interviews with “newsmakers” – and I may have to rethink that term as much of what is now considered “news” or “newsworthy” used to be considered garbage or “tabloidian” – don’t worry about spellchecking that … it’s a new phrase that I am coining with my poetic license, thank you very much. 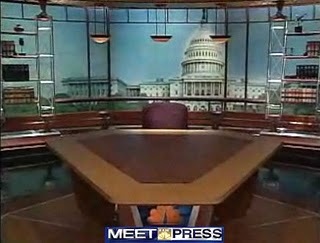 Let me begin by saying that I am a huge fan of “Meet the Press”(MTP) and I miss Tim Russert on that show … immensely. I have been watching it for years and think its reputation for bringing some of the biggest names, in a timely fashion, into our homes is stellar. Washington and world politics comes directly to all of us arm chair Commanders-in-Chief and Secretaries of State as we sit comfortably in our PJs, geeked up on our caffeine of choice, screaming at the TV and explaining to our imaginary Cabinet (or befuddled children) how we would do things differently. The timely delivery of these powerful public officials has done much to sustain the viewership of MTP and shows like it. That being said there is a growing “gotcha” feel that I am not all too sure can be counted as intelligent or journalism; much less “intelligent journalism”. The lure of appearing on MTP for those who hold public office or positions with federal agencies is that about 3 million people are going to see you and hear what you have to say. The danger of appearing on MTP is that about 3 million people are going to see you and hear what you have to say. In 2007, Neilsen Media Research data claimed that MTP was the number one public affairs show among adults aged 25-54. This is the group of folk who are really paying attention to what is going on in the world … okay … at least we should be. This is the workhorse demographic. If you look 5 to 10 years on either end of this range, a good number of folk aren’t really contributing to our economic engine in the same way. Before 25 years of age young folk are becoming adults and most haven’t yet settled on a career path. They have years to go before their earning potential peaks. On the other end of the spectrum, people beyond 54 years of age are looking to transition out of the “rat race”. Their earning potential peaked years ago and they would like to -at least – think about relaxing. Their grind isn’t the same. I can only hope to see that day … but with a 2 year old? … at 46? You are much more likely to attend my funeral than my retirement party. But I digress. The point is we are keen folk who watch these shows and we tune in because we are plugged in. We are directly, if not immediately affected by all political machinations. So each Sunday we sit down to see who is going to be on the proverbial “hot seat” this week. One would think that in today’s world of camera phones, open mics, youtube, “off the record” statements that somehow end up on the record, and other gotcha “journalism” practices, you are only as good as your last faux pas. In the case of MTP, when we see someone getting grilled or saying the exact opposite of something they have said before – sometimes years before – we are shaking our head or screaming at the television, nearly choking on our coffee trying to pass judgment on someone whose position we are likely never to be in. Yet many times it’s whoever is getting interrogated that week that helps make him or herself look guilty. With lobbyists, experts on specific issues and yes, even constituents, folk on Capitol Hill have information to which the rest of us have limited or no access. With more information ought to come more knowledge and a better perspective or grasp on a given issue. Sometimes that additional knowledge, that obscure report or the testimony of constituents whose lives could be completely decimated or forever lifted by the press of a “Yea” or “Nea” button is justification enough for changing the way one sees an issue. But admitting they didn’t have enough information to take a stand on an issue or that they found they were -get this – “wrong” on an issue is just not something most elected officials are willing to do. So here they sit on the MTP “hot seat” and the dance begins. They make contradictory statements, the host calls them on it and we label them a liar – or worse – a typical politician. We tune in week after week for much the same reason we rubberneck at accident scenes. That “gotcha moment” on MTP grabs politicos like The Jerry Springer Show grabs idiots. About the only thing that rivals that moment is how the issue, statements or misstatements get spun throughout the next week. But the formula works and has been for years. The intention of MTP is to interview public figures and hold them accountable for their words and/or deeds. In short, it is essentially a 30 minute press conference with one reporter followed up by a 30 minute panel discussion over the events of the past week. The clever part is that the seed to some of the issues discussed this week were planted last week from all the spin doctors trying to correct statements from their bosses … who at the end of the day are mere mortals. Real people with real families and real lives just like us. I have to admit that I find it interesting that when the show began on radio in the late 1940’s it was hosted by a woman. By the time televisions made their way into most homes the host was a man. In fact, for more than 50 of its 63 years the host of MTP has been a man and for a year in the mid eighties, men, as Roger Mudd and Marvin Kalb co-moderated. 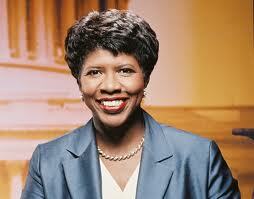 Martha Rountree holds the distinction of being the only female employed as moderator of MTP. I only throw that in because I find it interesting for a show that was viewed by so many as “cutting edge”, the edge isn’t sharp enough to seriously entertain the possibility of a minority host. Though the show co-created by a woman there has not been a female permanent host in over fifty years. Why not? Hypothetically speaking, would it be so bad to tune in on Sunday and see … say … Gwen Ifill, Michele Norris, Leslie Stahl, Natalie Morales or Suzanne Malveaux on your screen? Would the news be somehow less “newsy”? Would World events lose their importance? I think not. Someone wiser than I coined the phrase, “information is power” and if that is true then so is the fact that misinformation is an epidemic. Despite some of what I mention here, I will continue to watch MTP (and shows like it), read papers, articles, books, attend forums and events because I like to be informed. With an equal measure of passion, I like deconstructing misinformation, reading body language and listening to what is not being said. So I leave you with one request … regardless of where you get your information, think and think critically before speaking of, acting on or most certainly spreading what you consider to be “news”. Well, I’ve got to go because it’s the weekend! In fact, it’s Sunday … “And if it’s Sunday … “.